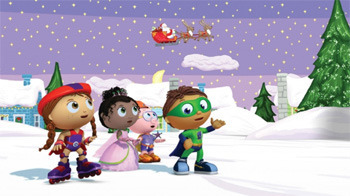 PBS Kids has released two new DVDs – Super WHY! 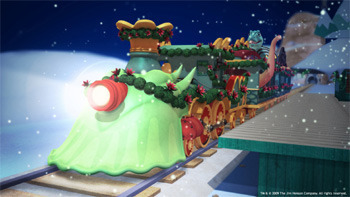 : ’Twas the Night Before Christmas & Dinosaur Train: Dinosaurs in the Snow – in time for winter and the holiday season. Check out our reviews of these new DVDs! ’Twas the Night Before Christmas and all through Storybrook Village not a creature was stirring except for Whyatt, who has an important question for Santa! The Super Readers catch up with Santa and his reindeer as they gallop from rooftop to rooftop and unravel the mystery of Santa’s childhood, discovering along the way how to help spread the magic of the holiday. This DVD includes four exciting and educational fairytale adventures, interactive games, music videos, resources for parents, printable activities and coloring pages. Buddy and his Pteranodon family ride the Dinosaur Train to the North Pole, where it's cooler out and the skies are dark all winter long! The kids get to play in the snow and slide on a frozen pond for the first time. The whole Pteranodon family have fun celebrating Mom's favorite holiday, Winter Solstice. 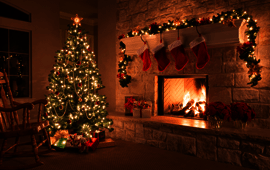 They learn about large conifer (evergreen) trees and help decorate them at a holiday party.